Global supermarket chain ALDI now offers its own impressive range of affordable, SIM-only mobile plans. Already established as both a mobile provider and retailer in several European countries, ALDI’s Australian launch sees it go head-to-head with Woolworths Mobile and Coles Mobile in the supermarkets-turned-telcos space. ALDI Mobile provides prepaid plans that are contract-free, affordable, and easy to self-manage. There’s standard 30-day plans with unlimited talk/text and capped data, as well as long-lasting pay-as-you-go plans ideal for infrequent mobile users. If you sign up for ALDI Mobile, you will need to provide your own phone, as all plans are SIM-only. However, this does mean ALDI is a good option for customers wanting a flexible prepaid plan with no bill shock, lock-in contracts or need for expensive phone purchases. ALDI Mobile plans are exclusively prepaid, so you’ll pay for your usage upfront. So if you’ve had issues in the past with overages or unexpected charges, your ALDI plan is a great way to protect against bill shock. Value Pack plans are offered on a 30-day basis and start from a low $15 per recharge. These plans, three of which are listed below, include unlimited talk and text in Australia, high-speed data use, and (depending on the plan) international calling and texting. Casual, pay-as-you-go plans are also available, again starting from $15 per recharge. If you’re after good value for the whole family, a Family Pack includes 40GB of data over 30 days for $80 and includes four services under the one account. What does ALDI Mobile offer? If you consider extras such as free Foxtel, data-free streaming, or live sports to be essentials rather than luxuries, ALDI Mobile probably isn’t the provider for you. But if you want a budget-friendly plan offering good value and some international features, ALDI covers all the basics. Below are some of the features you may or may not find on ALDI Mobile’s plans. Green ticks indicate a feature is included in, or available on, ALDI Mobile service. ALDI Mobile uses the Telstra 4G and 3G network to deliver its phone and data services (which also plays host to the likes of Boost Mobile, TeleChoice and Woolworths Mobile). This means that ALDI Mobile customers will have access to most of Telstra’s impressive nationwide coverage. Unfortunately, Telstra’s ultra-fast 4GX service isn’t included on ALDI Mobile plans, but you’ll still get great speeds from standard 4G. This makes ALDI a great option for most Australians, although customers in rural areas may need to double-check online to ensure they’ll be completely covered. 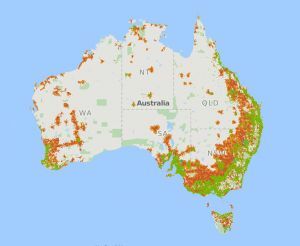 Below is a screenshot of ALDI Mobile’s current 4G and 3G coverage, represented by the green and orange/brown areas. More detailed coverage information can be found at ALDI Mobile’s website. All of ALDI Mobile’s plans come with the standard talk and text, plus data use within Australia. All Value Pack plans include data rollover, and international calling is featured on plans of $25 and up. International calls: ALDI Mobile’s Large, Extra Large, Extra Extra Large and Jumbo plans all include unlimited standard international calls to 15 countries, and up to 400 minutes of calls to 35 additional countries. Unlimited calling countries include Canada, China, France, Germany, Hong Kong, India, Indonesia, Ireland, Japan, New Zealand, Pakistan, South Korea, Thailand, UK, and USA. Data rollover: All Value Pack plans allow users to roll over any unused gigabytes to subsequent months. To keep your leftover data, you’ll need to recharge with a Value Pack of the same or higher value, within 24 hours of your current plan’s expiry date. Add-on data: Additional data can be added to your plan at any time, for $10 per gigabyte (to a maximum of 40GB). Auto-recharge: Customers can set up an automatic recharge for any Value Pack through the ALDI Mobile app or online account portal. International roaming: ALDI Mobile customers can use their service overseas in selected countries, provided there is adequate pay-as-you-go credit on their account. Rates for talk, text, and data will vary between countries, with data available for up to $1.00 per megabyte. ALDI Mobile’s best value products are the aptly-named Mobile Value Pack plans, which offer contract-free postpaid service. Customers can choose from five pack options, with prices beginning at $15 every 30 days for unlimited standard national talk and text, plus 2GB of data. Data inclusions up to 40GB are available, and all plans include data rollover – this means than any unused gigabytes will roll over for later use, so long as you recharge your Value Pack on time. ALDI Mobile’s Large, Extra Large, Extra Extra Large and Jumbo plans also feature unlimited standard calls from Australia to 15 countries, including China, Hong Kong, India, New Zealand, the UK and the US, plus up to 400 minutes of calls to a further 35 countries. All ALDI Mobile Value Packs come with a 30-day expiry, and as there’s no lock-in contracts, you can switch between plans with each recharge. All five options are listed below. As the name implies, the Family Pack is set up as an easy way to bundle and manage plans for the whole family. This plan allows you to have four different SIM cards under the one account, with one account belonging to the ‘owner’ and the other three set as ‘users’. The plan owner is able to monitor the usage of the other users, add and remove users and set data limits. For $80 over 30 days it includes unlimited standard national calls, SMS and MMS, plus unlimited standard international calls to 15 countries. For your data, you’ll get 40GB to share across the four accounts, with the owner able to set data limits on the plans for the three users, and all leftover data available for the owner. While you don’t have to set user data limits, it’s a handy feature to ensure there is data available for everyone to use. Unused data will roll over indefinitely, and without expiry, if you recharge before the 30-day expiry or within 24 hours of expiry on the Family Pack. If you go over your data allowance, you can also buy extra data at $15 for 3GB (with a maximum of 40GB add on data at one time). If you and your family are new to ALDI Mobile, you’ll have to buy SIM cards for each user. Otherwise, if you or some of your family are already ALDI Mobile customers, there are ways of transferring existing accounts over to the family pack. How does ALDI Mobile compare? ALDI Mobile isn’t the only telco offering Telstra network coverage at lower prices. The following providers also use parts of Telstra’s 4G and 3G networks. Is ALDI Mobile a good deal? If you want a flexible, simple prepaid plan with good data inclusions and no unnecessary extras, ALDI Mobile has plenty to offer. The telco’s Value Packs feature unlimited calling and texting, plus international extras and data rollover of up to 30GB – all at competitive prepaid prices. As ALDI Mobile piggybacks on the Telstra network, most Australians will receive great 4G coverage; however, you won’t have access to the super-fast speeds provided by Telstra’s 4GX service. ALDI Mobile customers will also miss out on other Telstra benefits, such as free WiFi hotspot use and included entertainment streaming. However, with plans starting from just $15, ALDI Mobile does offer serious savings when compared to bigger-name providers. Customers wanting a SIM-only plan will fit right in with ALDI, but if you’re hoping to buy a brand new smartphone as part of your mobile plan, you’ll need to look elsewhere. ALDI Mobile is bring-your-own-phone only, so you will need to have an unlocked device handy in order to sign up to the company’s prepaid mobile service.